Daylighting is the use of windows and skylights to provide supplemental lighting, in the form of direct, diffuse, or reflected sunlight, for building interiors. This is an aspect of passive solar energy relevant to every home. Today's highly energy-efficient windows, as well as advances in lighting design, allow windows to be used very effectively reduce the need for artificial lighting during daylight hours without causing heating or cooling problems. The best way to incorporate daylighting in your home depends on your climate and home's design. The sizes and locations of windows should be based on the cardinal directions rather than their effect on the street-side appearance of the house. 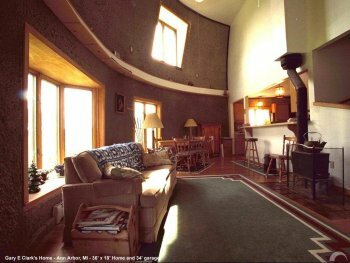 If you're constructing a new house, you want to consider daylighting as part of your whole-house design – an approach for building an energy-efficient home. Since advanced windows can provide daylighting in a home with little or no increase to yearly heating costs, the opportunity to increase daylighting in home design is much greater than ever before. In building design, however, one should be careful not to have too many windows and/or locate them improperly so that the building does not overheat, or add an unreasonable air conditioning load to the building.